Late payments and contractual disputes are a major concern for self-employed persons such as freelance photographers or producers. The Singapore Parliament will sit at 1:30pm on Monday, 18 February 2019, for the 92nd session of the 13th Parliament. *18 oral questions and 6 written question have been scheduled to be asked. THE European Parliament has given the green light to a landmark free trade agreement (FTA) with Singapore that is set to remove nearly all customs duties between the two jurisdictions. THERE are some bubbling signs of consolidation in the fintech space, as Singapore Life – an insurer largely distributing products online – snaps up payments service firm Yolopay’s assets to broaden its suite of services in the finance space. Submarines are key in keeping Singapore’s waters safe, yet with its shallow depth and the hive of activities in the busy Singapore Strait, the demands on the Republic’s naval forces are high. The Central Provident Fund (CPF) retirement payout scheme will be on the agenda when Parliament sits on Monday (Feb 18), after nine Members of Parliament tabled questions on the matter. Desalination — the process of turning vast amounts of water from oceans and rivers into fresh water — has been held up as the hope of water-starved nations such as Singapore. It is “critical” for small and medium-sized enterprises (SMEs) to plug into the digital economy, as it would make a noticeable impact on Singapore’s growth, Minister for Communications and Information S. Iswaran said on Sunday (Feb 17). A Singapore business school has launched Southeast Asia’s first major on sustainability. A plethora of gauges, indicators and buttons loomed menacingly on the panels in front of me. From Cape Town to San Francisco, cities have been toppling monuments to historical figures with troubling legacies. Mutual respect and trust are the foundation of a new set of Ministry of Education (MOE) guidelines on how parents and schools can work together for a child’s benefit. Cash-strapped Singapore water-treatment company Hyflux Ltd unveiled a restructuring plan that’s been highly anticipated by retail investors in the city-state, who own millions worth of the firm’s debt. No matter what they say about the sanctity of marriage, if one of you is sitting on a goldmine of family wealth, there’s a good chance the in-laws are going to insist you sign a prenuptial agreement before you tie the knot. Some eight in 10 small and medium enterprises (SMEs) in Singapore are expecting the government to announce more incentives at Budget 2019 to help support business growth amid a challenging economic environment. Does Singapore’s Ministry of Health deserve immunity for data breach? It is believed the hackers were after the medical data of Singapore’s prime minister and cabinet colleagues. There was an inquiry and the local privacy watchdog, the Personal Data Protection Commission (PDPC) fined the hospital and its technology vendor a total of S$1 million. Tomorrow, Finance Minister Heng Swee Keat will arrive at Parliament House to deliver his fourth Budget speech, setting the tone for Singapore’s spending in the coming year. it’s a uniquely Singaporean economic abbreviation that stands for net investment returns contribution. But growth in trade and export eases in 2018 and is expected to slow further in 2019, And both the trade and the non-oil domestic export (NODX) growth are tipped to ease further to zero to 2 per cent in 2019, according to Enterprise Singapore. Of the people who’ve advised me to just marry a rich man instead of slave away to earn money, there have been close friends, superiors at work and even complete strangers here in sunny Singapore. ValueChampion, a research company, has recognised Singapore as Asia-Pacific’s most millennial-friendly city. Tokyo placed second while Hong Kong ranked the third-best destination for millennials to move in. The dry and warm weather experienced over Singapore and the surrounding region in the first fortnight of the month are forecast to persist in the second half of February 2019 due to stable atmospheric conditions arising from the presence of a dry air mass over the Southeast Asia region. Singapore’s economy grew at its slowest pace in more than two years in the fourth quarter, data showed on Friday, and the city-state’s trade ministry warned that manufacturing is likely to face significant moderation this year. Dry and warm weather is expected to continue in the second half of February, said the Meteorological Service Singapore on Friday (Feb 15).It added that Singapore and the region are in the dry phase of the northeast monsoon season. Sales of private homes by developers in Singapore fell 17.8% in January from a year earlier, government data showed on Friday. The wave of National Service (NS) deaths that occurred recently have led Prime Minister Lee Hsien Loong and the Singapore Armed Forces (SAF) to go all out to emphasize safety and to have a zero fatality mindset during training exercises. Member of Parliament for Nee Soon GRC Lee Bee Wah was criticised on her Facebook page by cat feeders after she said in Parliament that she wanted the Agri-Food and Veterinary (AVA) to disallow cat feeders to leave food unattended for two hours in areas that have rat problem. 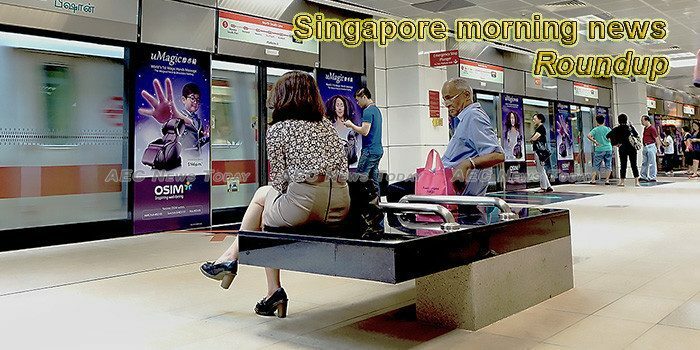 For the past three years, Singapore’s MRT network has tripled in its reliability and capacity. In doing so, Transport minister Khaw Boon Wan, cited in Parliament that it has become a burden for train operators. Team Singapore will be led by former athletes Juliana Seow, Valerie Teo and Chung Pei Ming at the 2019 SEA Games in the Philippines, said the Singapore National Olympic Council (SNOC) on Friday (Feb 15). The Singapore Armed Forces has a duty to continue training and fulfilling its operational duties, as the Republic cannot outsource its security and defence to anyone else, said Prime Minister Lee Hsien Loong. Education Minister Ong Ye Kung gave a speech on February 11, at the annual conference of the National University of Singapore’s Middle East Institute (MEI) where he drew a parallel between his role as education minister and foreign affairs. Communications and Information Minister S Iswaran on Friday (Feb 15) urged Singaporeans to be responsible, alert and secure online, as he outlined measures on implementing Digital Defence – Singapore’s sixth and newest pillar of Total Defence. Despite a 27% drop in its 3Q19 earnings to $284.1 million, Singapore Airlines (SIA) is a still a “buy” in analysts’ books. If you were out and about on Wednesday evening (Feb 13), you may have noticed a strange phenomenon in the sky.